When I saw that Rainbow Rowell had produced a novella/short story for World Book Day, I couldn't resist the chance to give it a try. 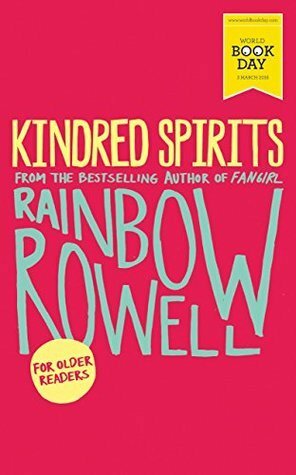 Having read so much praise for Rowell's works, I was excited to read Kindred Spirits, particularly due to the short format which meant I'd be able to digest it in a single sitting. The story is told from the viewpoint of Elena: a Star Wars fangirl who has decided to queue for tickets to watch the latest installment of the science fiction series at her local cinema. Elena expects there to be crowds of people as obsessed with the series as herself: cosplayers and film buffs who are as excited to see the new film as herself. Disappointment sinks in when she realises that only two others have decided to camp out to guarantee their tickets... and that she has to pee in a cup! Despite the compact format, Rowell's character development was achieved rather well, yet, for some reason I couldn't properly engage with Elena. I really wanted to enjoy Kindred Spirits, and hoped it might be something I could pass over to my daughter at a time when her reading habit has got stuck in a rut... So, Rowell devotees, please forgive that my rating is likely far less than you would envision. I rate my reads in terms of how much I personally enjoyed them: a subjective store, if you will, as opposed to what I think a literary work would deserve. In terms of value for money, as a quick read for a commute, I'd recommend it. As an introduction to the world of Rainbow Rowell, I found it - unfortunately - dissatisfying.